So I've been super anti-9/11 conspiracy theory all these years. Just ask my husband. Why should I think such horrible thoughts? It's unimaginable. Disgusting. Then I consented to watch 9/11 Press for Truth off the internet. It's well done and more of a documentary that makes you ask questions for yourself--it doesn't shove a theory down your throat. Then I watched Loose Change 9/11 and had some discussions. Now I'm reeling and upset. For good reason, too. I consider myself to be pretty rational about most things and not easily duped. Well I was duped, but not by these shows. It's hard to imagine that our country is actually NOT that much different from all the other countries of the world who've experienced the corruption, deceit and plain wickedness of a government. I secretly was hoping we lived on a utopic island. I'm not going to go into what parts of these so-called theories I do and do not believe. To me, at this time, the main point is that something dark is lurking behind the public lies and, frankly, I'm still nervous to find out what it is. 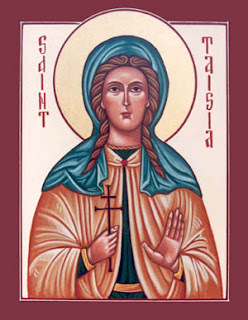 Taisia is named after Saint Taisia of Egypt (4th century) who is celebrated October 8, the day before Taisia's birth. 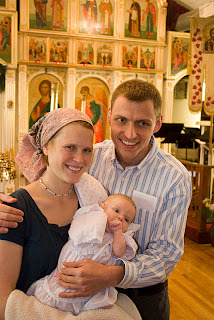 We are excited to baptize our lovely Taisia this month. I've been asked to clarify what is the expected outcome of this baptism. I am no theologian, but I do my best to understand everything and I'll do my best here to explain the Orthodox perspective. I welcome comments. Baptism is wonderfully mystical. I'm going to use a bunch of quotes to explain it (and more). But first it may help to note that the Orthodox believe that the human body is very important since Christ's incarnation-- he is fully man and fully God. We believe in a strong soul-body connection. Therefore when we profess a faith, it is very important to make deliberate actions with our bodies that equal/parallel our words and thoughts. Also, Orthodoxy is not a 'once saved, always saved' faith. Every day we either choose Christ/choose to live by the Grace we received at the baptism, or not. But baptism is the important beginning. It gives us a clean start and allows us to receive the gifts of the Spirit in order to work toward holiness. Infants should not be excluded from baptism as they too are guilty of original sin (many do not believe this); and why keep them from spiritual rebirth until they are older when it is that much more time for God's Grace to work in them! 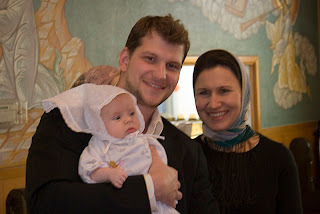 My baby is not guaranteed a free pass to Heaven by this baptism; but by it she is welcomed into the folds of the Church, is given a new life free of original sin, and is enabled to partake worthily in the Divine Mysteries (sacraments) through which the Spirit's Divine Grace or Energy flows into her. "Verily, verily I say unto thee, except a man be born of water and the Spirit, he cannot enter the Kingdom of God.That which is born of flesh is flesh, and that which is born of spirit is spirit" (John3:3-6). "Repent, and be baptised every one of youin the name of Jesus Christ for the remission of sins, and ye shall receive the gift of the Holy Spirit"(Acts 2:37-38). From these verses I get the idea that baptism is very important to our salvation. "We are buried with Him by Baptism into death, that like as Christ was raised up from the dead by the glory of the Father, even so we also should walk in newness of life" (Rom. 6:4). 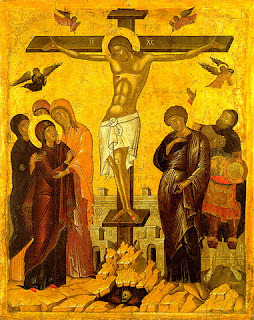 "Holy Baptism by the Holy Spirit, again unites him with the Divine Nature as it was when he was created by the hands of God, restores all the powers of his soul, renews them and brings them to the condition in which they were before the transgression of first-created Adam; in this way it leads him into the Kindgom of God, into which no one unbaptized can enter, and enlightens him with its light and grants him to taste its joys. Thus each one who is baptized becomes again such as Adam was before the transgression, and is led into the noetic Paradise and receives the commandment to work it and keep it--to work it by fulfillment of the commandments of Jesus Christ Who has recreated him, and to keep it by the keeping of the Grace[Divine Energy] of the Holy Spirit which was given to him through Holy Baptism, confessing that the power of this Grace which dwells in him fulfills together with him the commandments of Christ." "Baptism is not only a symbol of cleansing and washing away the defilement of the soul, but in itself is the beginning and source of the Divine gifts which cleanse and annihilate all the sinful defilements and communicate a new life. All sins are forgiven, both original sin and personal sins; the way is opened for a new life; opened is the possibility to receive the gifts of God. Further spiritual growth depends upon the free will of man. But since temptation is capable of finding sympathy in the nature of man, who from the day of his first fall into sin has had an inclination to sin, therefore spiritual perfection cannot be accomplished without battle." 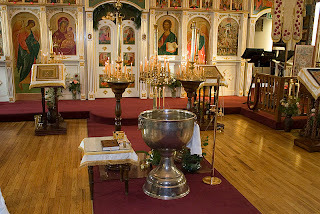 If you're interested here is a nice article discussing baptism into the Orthodox Church.It also describes what will be done at the baptism. I recently realized that I have an aversion to the crucifix. That bothers me. I need a new cross to wear around my neck. I really liked my previous one, it was a plain and simple three-bar Orthodox cross. It seems to have been the only one of its kind, though, as I cannot find one without the crucifix. I don't want one with the crucifix. This is how I have come to realize my enduring aversion to Christ depicted on the cross. Since I can remember Catholicism, with which I associated the crucifix, has been portrayed to me as wrong and icons as tools of trickery and idolatry. I accepted this without ever looking into either. For a long time I also had this general line of thought: Christ died on the cross. But then He conquered death, arose and ascended into Heaven. He died so I wouldn't have to. Death (and the ultimate sacrifice) is behind us, and now I must focus on my personal relationship with God and rest in His loving, protective arms. I still agree with this, but I find that I added some feelings and attitudes between the lines which I am now questioning. Between the lines is an even sunnier outlook on my spiritual walk. Forget the sorrow, forget the pain, forget the (real) sacrifice. To look at a man dying a horrible death on a cross every day is just as disconcerting as taking an honest look at my soul and describing it's ugly blackness aloud, for all to hear (and oh it will happen someday...before God...before the saints and angels...before the smirking demons). Actually, isn't that what happens when I look at the crucifix? My soul is exposed and I am the guilty one watching the innocent, beautiful One suffer my fate. To read about it is one thing, to see it is quite another. To be honest, deep down I'd rather encounter this once a year, like on Good Friday, with the buffer of sing-songs and sermons that point one big finger at everyone's sins, not just mine; makes me feel like I belong. And I like to remember that the one dying is God--He can handle it, plus He knew that He'd be alive again soon. It's an insolent thought. What I'm saying is that my soul doesn't totally grasp the reality of my place before God and what happened at the cross. I don't think I'd handle the situation with such ease of spirit if my innocent neighbor did this for me, died in my place. I'd be devastated and not a moment would go by without the vivid remembrance of what happened. Eventually I might move from devastation to determination to live a worthy life, but I'd be a changed person forever. The irony is that I was in love with the symbol of the cross (I say "was" because I have new thoughts and feelings about it all now). I put it after my name, I doodled a million of them in my notebook in class...But it's the cross without Christ on it that I loved. Now I wonder, what's the point? I do think that the cross in any form has been made a powerful symbol because of how God has used it. However, why prefer an empty cross to one that depicts the very reason it is important and powerful? I naturally want to forget the extreme, painful parts of my faith, or at least remember them minimally and with a grain of salt. At the same time I want to celebrate the wondrous, salvific results. I want to have my cake and eat it too. Well, I have to change. I need to find humility. I need to face Christ on the cross, let it move me, and learn to accept His saving grace and love for such an unworthy soul. I'm going to buy myself an Orthodox crucifix to wear constantly. Perhaps it is God's plan for me to be particularly conscious of it so that its purpose is not lost in routine. So that I remember His sacrifice and why He had to do it. So I remember that it is by God's grace alone that I live.